The Suwali Fund - Follow our progress. ​It has been a year since fundraising was completed to build the girls' dormitory at Parijat Academy. Progress has been slow, but construction of the first floor of the dormitory is projected to be completed by the end of January! Here is a selection of the most updated photos and a few that depict the dormitory in various stages of completion. Thank you so much, again, to everyone who has been a part of this project. From the donors, the construction workers, Seuti and Rupali and the other girls that have come to Parijat Academy from Garbangha, to Uttam Teron and Aimoni Tumong, this would never have been possible without each of you. Thank you. 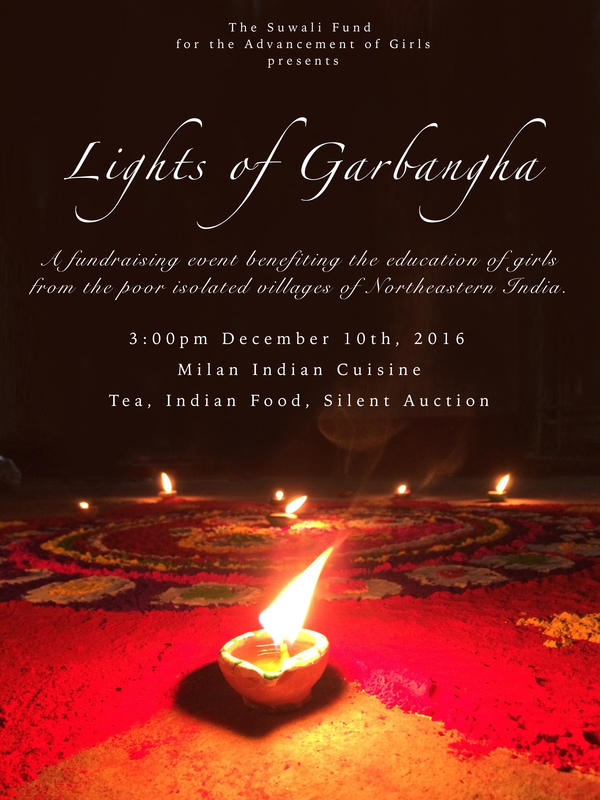 Join us on December 10th for an afternoon of tea, Indian food, and a silent auction featuring unique items I bring back from India!! Milan Indian Cuisine has generously provided the food and venue. This allows 100% of ticket sales to be used for building materials and construction costs of the girls' dormitory at Parijat Academy!! I've named th event "Lights of Garbangha" because that what these girls are. They are lights to their village, and education is light; enlightenment. Finished raising funds for the roof of the ground floor! We have officially reached the $2,601.32 USD needed to fund the roof of the ground floor!!!!!!!! Here is a reminder of the conditions we are changing. I am so proud of everyone who has joined in this cause. Thanks to all our supporters, our girls won't have to worry about a dilapidated, asbestos roof riddled with holes that leak rain water. Thank you so much. I hope you all understand how much of a difference you are making in these girls' lives and the lives of other village girls. Now let's use this momentum to gather donations for the second floor! SHARE SHARE SHARE. Today I returned from the village of Garbangha, the village where these girls are from. 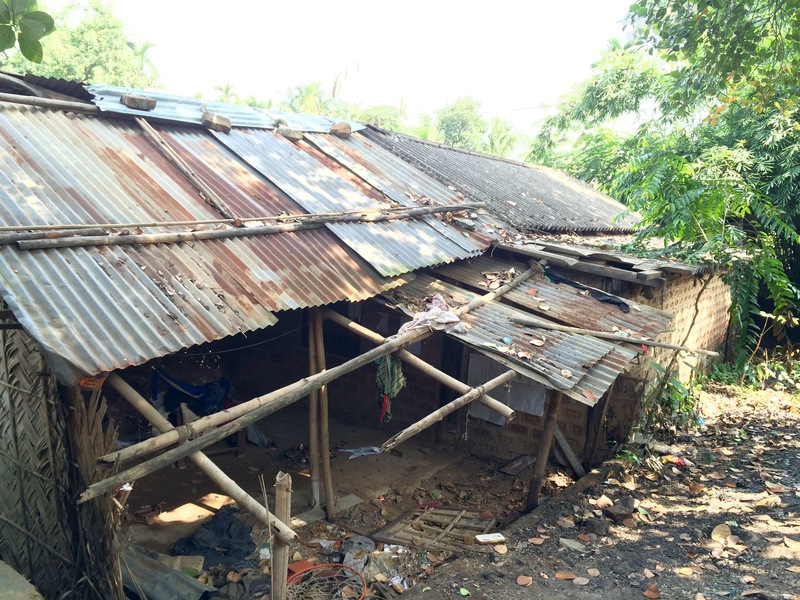 The urgency of this project was renewed when I met a girl my age (19) who was working in the rice fields. 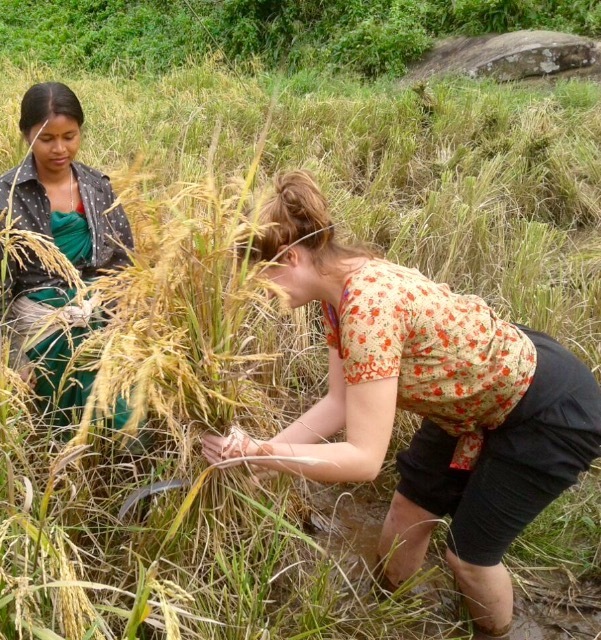 She taught me to cut rice with her and we stood together barefoot in a foot of mud cutting rice. I learned that she had two sons at home, one five years old, the other 3 years old, and she works in the rice fields all day, everyday. She will continue to have babies until she cannot anymore, and she will continue to work in the rice fields until her bones give out. This is the fate of all village girls. We need to stop this cycle of poverty and oppression. Suwali Fund Fundraising Total: $1012.44. We had an incredibly generous donor this week who donated $500.00. What a wonderful week we have had! This week Lynette Kelly visited Parijat Academy for the seventh time. She runs her organisation “Friends of Parijat” from Adelaide, Australia. Her organisation has done so much for Parijat, and she is the brains behind many fundraising programs that have become crucial to Parijat’s continued growth and excellence. She and her husband had been considering donating money to build a new girls’ dormitory for quite awhile, and this year she has decided to do it! When she learned of my project, and came to India and spoke with me, she agreed to work with me to make this new girls’ dormitory a reality as quickly as possible! Lynette brought her friend, Kathryn Brice, who also works at the University of Adelaide and Kath has also agreed to donate to our cause! Together, their money will be able to build the entire first level, and so I only need focus on fundraising for the next level and the top! I am so happy. Lynette also has a ton of experience in fundraising, and she has been sharing advice with me all week. She has held several incredibly successful fundraising events, and I think I would like to host a Suwali Fund Event in Charlottesville when I am back in the USA. Basically, it is a fun event, such as a dinner party or picnic or something that I sell tickets for ahead of time and the money from ticket sales goes to The Suwali Fund. Any ideas for a Suwali Fund Event? If anyone has connections to local Charlottesville restaurants, caterers, or artisans, please let me know! Lynette really is incredible. Such a kind giving person. And Cath too is so generous and kind. It has been so much fun to have them here this week and I will be sad to see them leave Friday! Thank you all for keeping up with The Suwali Fund!! Have a week full of beauty and happiness and light. Welcome to The Suwali Fund blog. This page will be updated with the latest construction and fundraising news every Wednesday. This page will also feature the girls' stories, hopes, and dreams, so that Suwali Fund advocates can get to know the girls they are helping. Want to follow the whole journey?